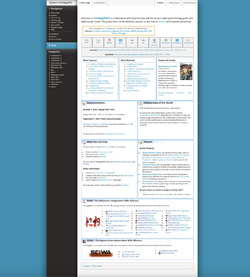 Welcome to StrategyWiki, a collaborative wiki which seeks to become the largest source for copyleft video game strategy guides. As a wiki, everyone is encouraged to register and contribute to the compendium. To lead you in the right direction you may want to read up on some of the basics of StrategyWiki and wikis in general. Luckily, such information is contained within this guide and its related pages. Here you will become acquainted with the basics of StrategyWiki. You'll learn about signing up, setting your personal preferences, understanding the wiki markup language, saving your work, and getting help. You may want to skip a few of these sections if you are already familiar with the basics of MediaWiki. The main meat of the guide is contained in the walkthrough. It describes how to lay out a new guide, where to locate relevant information, how to add information to an existing guide, and how to make a guide bring in readers. Finally, it will provide useful links to all sorts of helpful resources. And remember, this is a wiki, so feel free to add any information to this guide that you feel is useful. if you have a specific question and you can't find the answer that you're looking for in the guide, you can always leave a message for the staff in the Staff lounge. Here, you can address a specific concern that you have regarding the construction of your guide, and it should be answered fairly promptly by any one of StrategyWiki's guide experts. This page was last edited on 13 May 2018, at 10:15. This page has been accessed 261,575 times.